The TH100 is an incredibly versatile amp packed full of face-melting rock and metal tones, but capable of cleaning up to a sparkly chime. 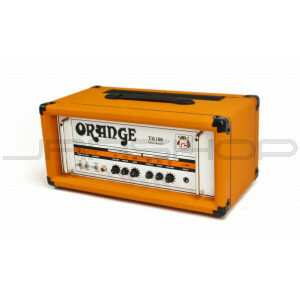 Those who hear it reminisce about the now infamous Orange AD140, an amp considered by many to have been the best lead amp ever made. The TH100 has only six knobs split between dedicated clean and dirty channels. Dial in everything from blues to country, classic rock to nu-rock, and then finish off by dialing the shape knob to 10 for the perfect metal tone. A power selection switch on the amp’s front panel, coupled with the option of removing two output valves from the circuit on the back panel, allow the player to choose between 100 watts, 70 watts, 50 watts, and 35 watts RMS output. It’s like having 4 amps in 1!